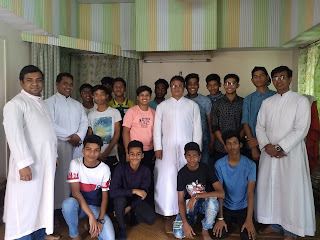 On June 10, 2018, the Parish of Nirmol Hridoy Girja, Monsada had twin celebrations: The Sacrament of Confirmation, and the installation of the new Parish Priest, Fr. Johny Nedungatt, SDB, by Archbishop Thomas D’ Souza. A big number of Parishioners and the three religious Congregations of Sisters of the Parish participated in the Holy Mass, to celebrate the events. Seventy nine candidates from the six centers which make up the Parish received the Sacrament. The Archbishop after introducing the meaning of the installation and its symbolic expressions read out the appointment letter of Fr. Nedungatt as the Parish Priest. With over two decades of experience in the formation ministry, Fr. Nedungatt had spent the past year as the financial administrator of the Salesian community at Monsada. The Holy Mass was followed by a short cultural programme. On 9 June, 2018 were the Priestly Ordination of Deacons Anjit Ekka and Ritesh Kujur at Our Lady of Happy Voyage Church, Howrah. 30 priests joined in the Con-celebration. Following the Liturgy of the Word the candidates presented themselves for ordination before the Archbishop. The Archbishop in his homily highlighted the characteristics of a shepherd which is to love the people entrusted to him just as he loves Christ whom he servers. The Archbishop expressed gratitude to the parents of Fr. Ritesh and Fr. Anjit. A short cultural program was followed by a lunch for the community, priests and religious. 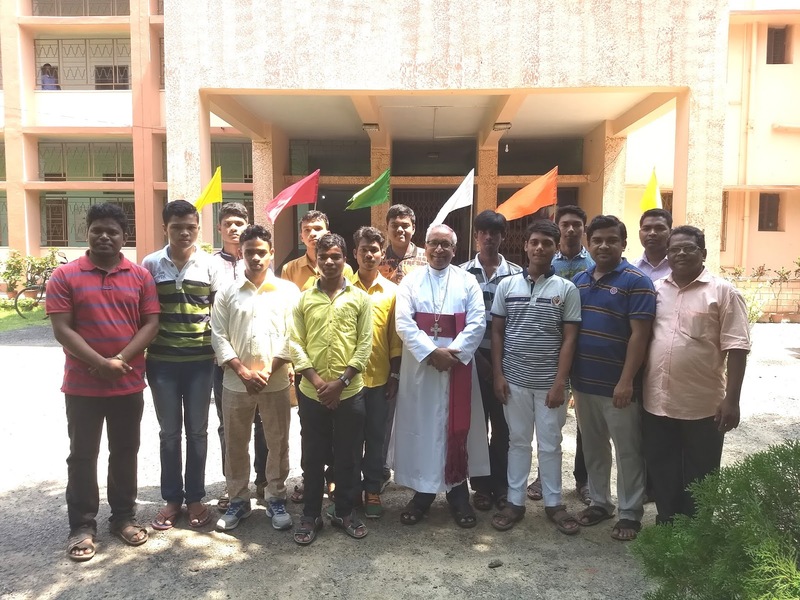 VOCATION CAMPS IN THE ARCHDIOCESE OF CALCUTTA! Fr. John Soren and Fr. 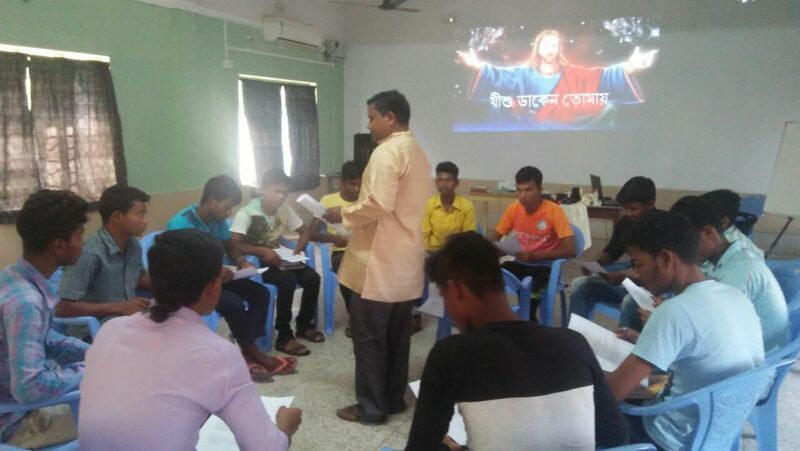 Sandeep Ekka organised the Vocation Camp for Midnapore Deanery from 16-18 April 2018 in Seva Kendra Extension, Hijli, Kharagpur. The theme was "Whom shall I send...? I will go! Send me." 16 boys participated in the camp. Talks were given by Fr. Simon, Fr. Mohan, Fr. Peter and Fr. Sudhir Tudu, the Dean of Midnapore. 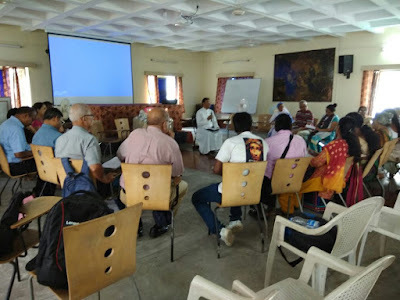 A combined Vocation Camp for Calcutta and Howrah-Hooghly Deaneries was organised in Seva Kendra, Calcutta from 28-29 April 2018. Fr. Michael Biswas, Fr. Kamal Kishore and Fr. Jesu Retchahar gave sessions on the theme "The harvest is plentiful, but the labourers are few." 15 boys from the Parishes of the Deaneries participated in the camp. Fr. Moloy D'Costa, the Dean of Calcutta, was the main celebrant for the final day Eucharistic Celebration. The Vocation Camp for the (N) 24 Parganas Deanery was organised by Fr. Ananda Halder from 12-14 April, 2018 in Proggaloy, the Archdiocesan Pastoral and Development Center. 25 boys from the Parishes of the Deanery participated in the camp with the theme: "Vocation: A gift of the love of God." Fr. Anthony Rodrick, the Dean of (N) 24 Parganas and Fr. Henry Saldanha were the main celebrants at the Eucharistic Celebration on both the days. The Archdiocese of Calcutta will host the 27th World Day of the Sick from 9-11 February, 2019 at St. Xavier’s College, Kolkata as announced by Archbishop Prakash Mallavarapu of Visakhapattanam & Chairman CBCI Healthcare Office. Archbishop Thomas D’Souza presided over the meeting on 23 May, 2018 at Archbishop’s House to sensitize the Core Group in the presence of Archbishop Prakash Mallavarapu and Rev. Dr. Mathew Perumpil, Director General, Catholic Health Association of India and the Archdiocesan Health Care Commission. 20 delegates from Rome and 20-25 delegates from other countries will attend amounting to over 300 participants. Archbishop Thomas D’Souza will be the Chairperson and Fr. Franklin Menezes, Director of Seva Kendra will be the Organizing Secretary. The Core Committee will meet again on 19 June 2018 at 5 pm at Archbishop’s House. Kolkata has been chosen by Rome in view of Mother Teresa’s Congregation who are engaged in looking after the poorest of the poor. The Laity Commission of the Archdiocese of Calcutta in association with the West Bengal Minority Commission organised a Seminar on schemes and facilities available for the Minorities on Saturday 28th April, 2018 at 5pm at Archbishop's House. The Seminar started with an opening prayer and a hymn by Rev. Fr. 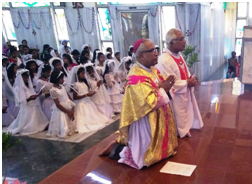 Dominic Gomes, the Vicar General and Coordinator of all the Commissions of the Archdiocese of Calcutta. Mr. Alexander Anthony, Secretary of the Laity Commission then welcomed Mr. Michael Shane Calvert, Vice Chairperson of the West Bengal Minority Commission, Dr. Swapan Roy, Manger Education, Mr. Ambar Hussain, Program Executive and Md. Farook, Education Supervisor from the West Bengal Minority Development & Finance Corporation. He also extended a warm welcome to Ms. Elina Dutta Founder Director & Chief Strategy Officer and Mr. Tamojit Dutta, Managing Director from Tribeca Care Pvt. Ltd. and all the representatives from 17 Parishes and 15 Schools from the Kolkata Deanery. Mr. Shane Calvert informed the participants that the Christian Community is not making full use of all the schemes and facilities available because of lack of awareness and how it is very important to reach information to all parts of the State. He also informed that he has been traveling a lot to the districts and requested Fr. Dominic Gomes to inform all parishes in the districts to approach him when he is there to create awareness among the community to avail of all schemes and facilities available for the minorities. He then introduced the representatives of Tribeca Care to give a short brief of their enterprise and its activities. Ms. Elina Dutta and Mr. Tamojit Dutta informed all present that Tribeca Care is Eastern India's largest Elder Care Company with a social impact mandate. It ha s a triple deckered initiative, focusing on geriatric and home care locked with the reskilling of young adults. The resource persons from the West Bengal Minority Development & Minority Corporation then gave a power point presentation on Pre and Post Metric Scholarships , Education Loans, loans for Self Help Groups and Small Scale businesses which comes under Minority Women Empowerment programme. In the open house question hour session while answering all the queries put forward by the participants the resource persons assured everybody to contact them directly at their office for any query or help required in applying for any scholarship or loans. Mr. Shane Calvert during concluding session requested all participants to take the help of Mr. Crispin Coelho, teacher and Mr. Francis Gomes, Principal of Park English School for the scholarships as they had helped 670 students to apply and get scholarship disbursements last year and to take the help of the Laity Commission and CAB to apply for loans. At the end of the seminar Fr. Dominic Gomes thanked Mr. Shane Calvert for his presence and participation and for arranging all the resource persons for the seminar. He also extended his gratitude to the Laity Commission members for organising the Seminar and working very hard to bring more than 100 participants from all the school s and parishes for the seminar . The program ended with light refreshments and tea sponsored by Ms. Angelina Mantosh Jasnani. Kolkata: In reference to the proposed SCC National Convention, Archbishop Thomas D ’ S o u z a h a s w i l l i n g l y expressed his consent to hold the Convention in Kolkata in 2019. A Meeting was held on 16th April, 2018 together with Dr. Fr. Thomas Vijay, SAC, Secretary, NST for SCCs (CBCI), Sr. Christin, HC, NST Member and Sr. Gr a c ema r y, NST Member. Archbishop Thomas, the Chief Host, formulated and h e a d e d t h e L o c a l C o - ordinating Team for the SCC National Convention. Fr. 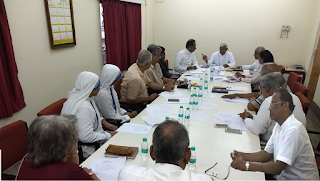 Dominic Gomes, Vicar General and SCC Coordinator for the Kolkata Archdiocese, informed the 22 Diocesan Service Team (DST) members during the meeting on 28 April at Archbishop’s House, Kolkata that a big National SCC Convention will be held in Kolkata from October 24 to 27, 2019. The theme is: “The Prophetic Role of SCC Today”. About 3000 people are expected to take part from other Dioceses. They will stay in the houses of the people of Kolkata to interact with them and form a wider S C C C o m m u n i t y a n d Fellowship. Transport will also have to be arranged for them to move around. Already a preliminary Core Group meeting was held on 16th April, 2018 , with Archbishop Thomas D’Souza of Kolkata in the Chair. Fr. Vijay T h o m a s , N a t i o n a l S C C Coordinator and Sr. Christin, H. C., National Service Team member were also present. The following Committees were formed at that meeting: Local Coordinator: Fr. Dominic Gomes; Registration: Fr. Robert Johnson; Youth: Allan Kujur and Rocky Gomes; Finance: Fr. Moloy D'Costa and Joseph Chacko; Reception: Sandhya Vincent, Lidwina Alphonso and I. N. Raju; Accommodation: Anand Kujur; Liturgy: Sr. Meena, Fr. Gregory and Sr. G r a c e m a r y ; C u l t u r a l committee: Cheryl Rodrigues; Exposure: Fr. G. Peppin and Sr. G u l a b ; Tr a n s p o rt a t i o n : Dominic and Sybil Azavedo; Catering: 1st and 3rd day Lunch and Tea: Eugene Gonsalves and Alexander Anthony; Health: Dr. Mary D'Cruz and Dr. Sapna; Sound Arrangement: (at the Convention Centre) Clement Gomes and Felix Thakur; Ushers: Fr. Michael Biswas and Anancia Fernandes; Media: Farrell Shah; and Security: Denis Lakra. The Groups with many bishops, religious and laity will arrive on 24th of October 2019. The programme will be from 25th - 27th October. Immediately, Fr. Dominic said that all the Parishes will have to have training programmes and the passive animators will also have to be awakened as it was a huge task to be done and it has to be done in a team spirit with every Parish having Training Programmes because on 26th October, 2019, the delegates will be taken to the different Churches in Kolkata where they will also witness Gospel Sharing and inter-act with the Parishioners forming a big SCC family. For this reason, the DST members were happy that Parishes, where SCCs are not active at present, will be activated and so representatives also came for the DST meeting like Sontu Mondal - Auxilium,; Sunita Mallick - Fatima and Leonard Ryan and Tony Rego - Infant Jesus, Behala. Now the other dominant Parishes will be contacted again by Fr. Dominic. Immediately, a meeting is fixed for May 26, 2018 in Archbishop’s House where the DST members will have to bring more members to form a team in the various Committees especially for accommodation and transport. As usual, Veneration of the Bible, Aarti and Scripture reading was done in the beginning of the DST meeting. Reports were read from the active Parishes. A very success story came from Our Lady Queen of Peace, Tollygunge. Mrs. Juliet Karak told that a Parishioner, Mr. Anthony Rata had a very bad motor-cycle accident in October, 2017. His treatment in the PG Hospital was not satisfactory as he was almost semi-paralyzed and he had no money. Immediately, Mrs. Sankari Mondal, SCC Coordinator for the Parish, contacted all the SCC units and also the Parishioners and got Rs . 7 0 0 0 . She then contacted the local MLA and got Mr. Rata readmitted in the hospital for an operation. According to Fr. Piter Pradhan, Parish Priest, whom we met on 27th April, Mr. Rata is now better and on the way for complete recovery. In order to make the SCC self-reliant, Mrs. Sybil Azavedo with the help of Fr. Rudolf D’Souza, Minister in Archbishop’s House; and from the Picnic Garden SCC, namely Mrs. Juana Bramblebee, Mrs. Daisy Samuel, Mrs. Roselyn Miles, Mr. Sumit Singh and Mr. Gavin Rozario arranged and brought a good breakfast and lunch with the DST members making some contributions.